Here’s the second part of the James Bond Collection by OPI. 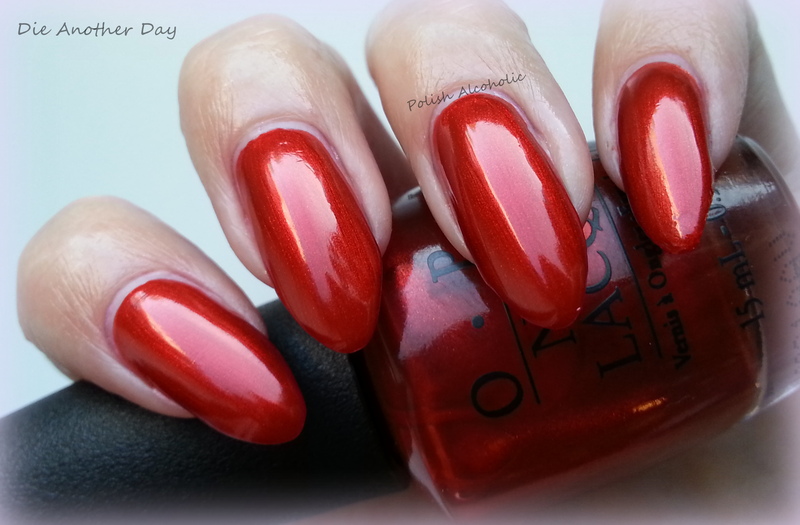 A beautiful bright red with superfine shimmer. Application is very nice. Here I’ve used 2 coats. This is a magenta glass flecked shimmer. Formula is a bit on the thin side, but that doesn’t give any problems. I’ve used 2 coats here. Casino Royale is a rich plum cream. Perfect for fall if you ask me. I’ve used 2 coats here. This one doesn’t need so much words, right?. It’s gold in a bottle. A bit sheer, so I’ve used 3 coats to get full opacity. Overall I love every single one of this collection. The formula of all is really fantastic! Click here for my swatches of the other 6 colors of this collection! Click here for my swatch and review of famous golden leafed topcoat named The Man With The Golden Gun. Don’t miss it! Which one(s) of this collection do you like? 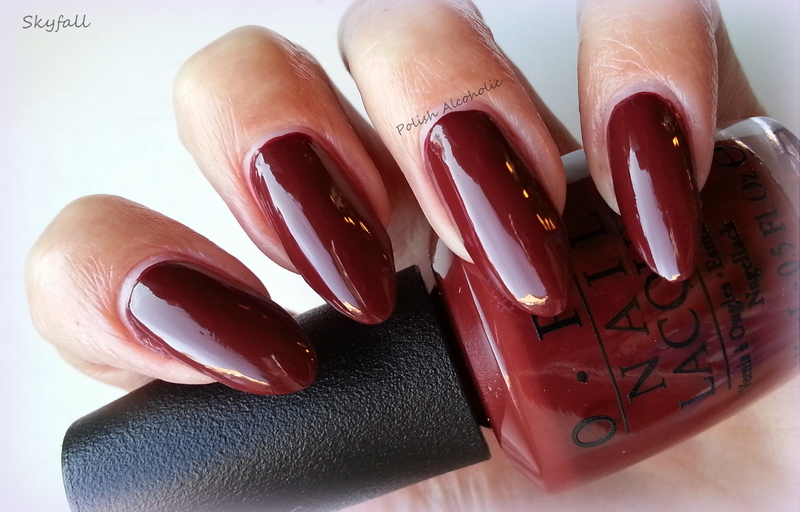 This entry was posted in OPI and tagged casino royale, die another day, james bond collection, opi, opi james bond, opi james bond collection review, opi james bond swatches, review, skyfall, skyfall swatches, swatch, swatches, the spy who loved me, you only live twice by Polish Alcoholic. Bookmark the permalink. Have all of these – only got Golden Eye cause 1 friend said it was unlike any other gold or glitter ever. Have to agree – it’ so shinny. But my fav of the entire collection here and part 1 is You Only Live Twice – it’s up there in my book of fav magenta glass fleck (winter appropriate) with Let Me Entertain You. I am insane for YOLT. I have nothing even close – it’s that tish of raspberry red in it that makes it really unique. Cannot wait to see your Man With the Golden Gun – I am not opening my sealed package box until I get the other 2 I ordered of same – want to open the box that is in the least best condition and save the other 2.